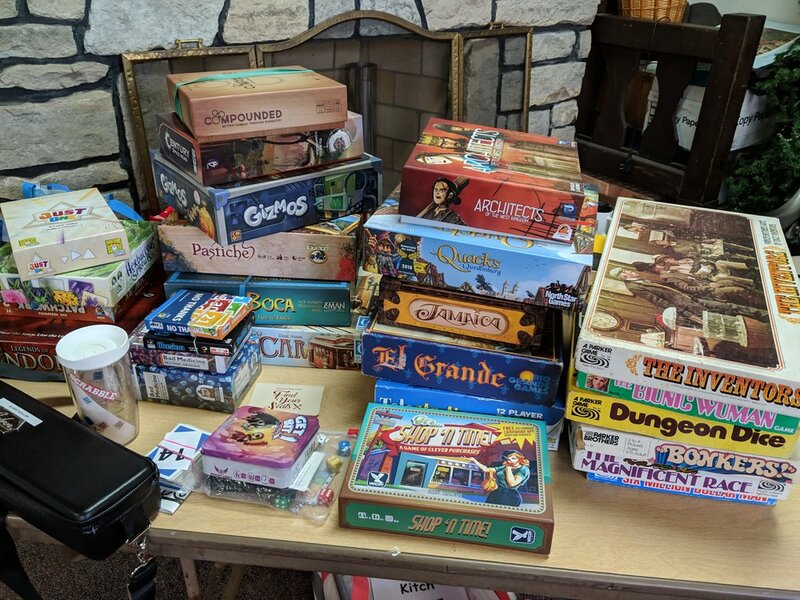 My pile of games we brought to start the library. 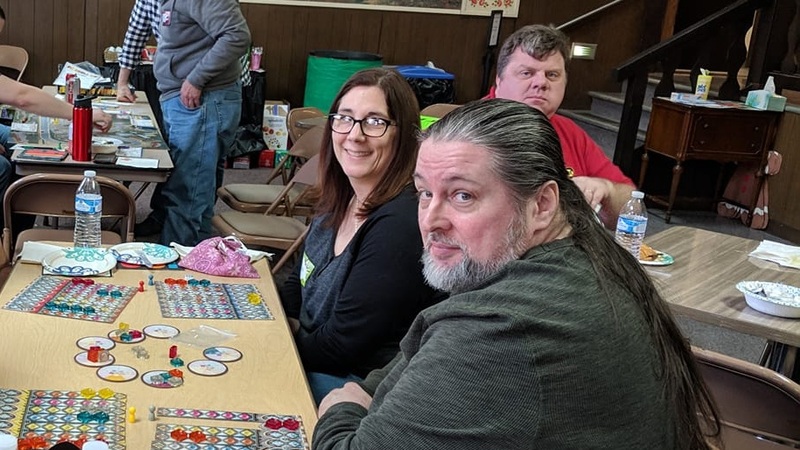 Saturday March 16, 2019 my wife helped my throw an all day game day for about 50 of my friends. 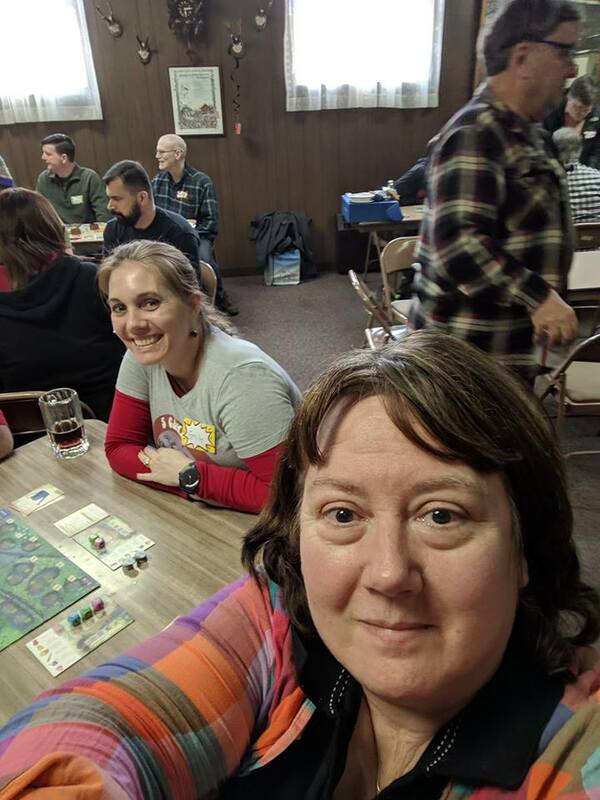 We rented a room at the Dayton Liederkranz-Turner German Club, a location we already have a game night at once a month. We scheduled it from 12pm-8pm and arrived a few hours early to set up. We started with laying out snacks and donuts, drinks and coffee for everyone. We were sitting there at 11:45 wondering if anyone was going to show up. Before long, most of the tables were full. I started with a game of Jamaica, because it played a large number of players and didn’t take too long. We opened up the bar, and that seemed to go over pretty well. The lunch meat and buns were all gone by about 4pm or 5pm so we ordered some pizzas to keep the party going. Bill and Angie, and Chris Funk looking in the background. Looks like Bill and Angie are playing Azul: The Stained Glass of Sintra. 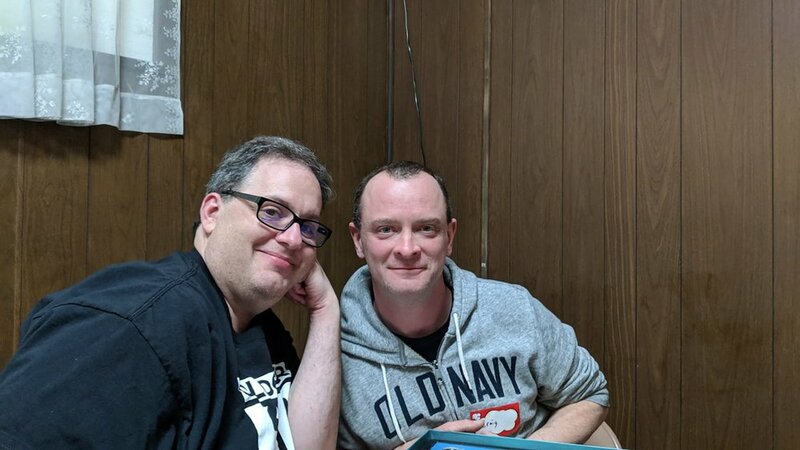 Mark and Carrie joined Dave and Charlie for a game of Terraforming Mars. They appeared to have every expansion. Carl and Alli Gannon joined Jon and Emily Detmer and their friend to play a game of The Magnificent Race. Carl introduced to me to it at his Kitchcon earlier this summer, and I played with the Detmers not long after that when I got my own copy. Cindi taught Scott Cozzilio from Epic Loot, Chris Funk and Emily Detmer — Herbacious Sprouts. We recently picked it up and had been playing it a bit. You can see me in the background playing my roll-and-write marathon. James Nathan and Dale Yu drove up from the south and brought along several roll-and-writes. They suggested a quite ridiculous variant of playing seven games at the same time, with one roll of several dice. Zach joined us. See the write up here. Close up of the seven roll-and-writes we played. I had played all but Wurfle Dice (middle left). I think Craig made the award for the most miles traveled to get to the party. He joined Chris Copac from NW Ohio and they road tripped down. Russ loves his racing games. Here is is teaching one of them. Suzi, Markus and Toby arrived and were happy to find some games they could play. I was jealous and wanted to try out Men At Work. I was able to play a game of Monza with them. Stephen and AJ had a new puppy and brought it along. 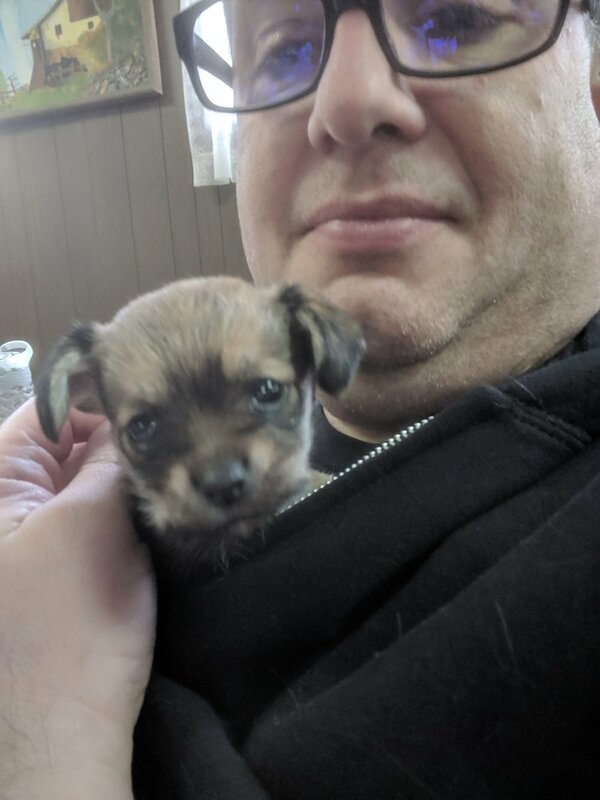 Cindi had me hold it a while, hoping I might want to adopt one of its siblings. 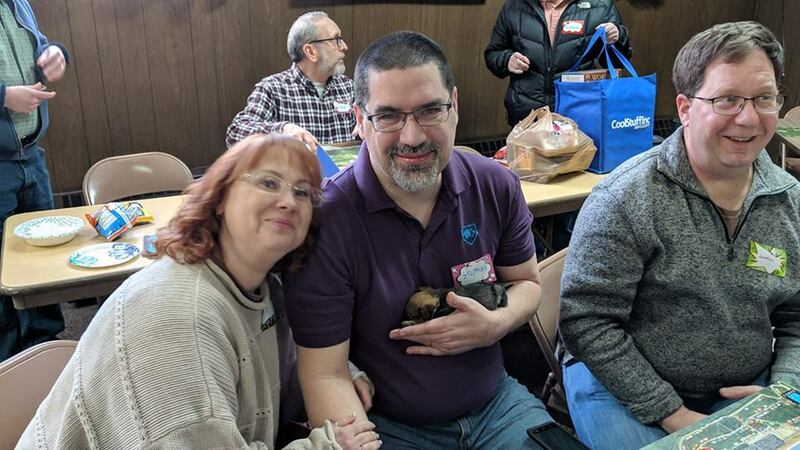 Fortunately for us, they also have a monthly meet up at their house — so we can just visit their puppy and not have to have our own. People figuring out their best play in the race game Jamaica. Setting up one of my favorites — La Boca. Never been a big fan of cake. I opted for one of my favorite donuts. Overall, it was a great day. Unfortunately I didn’t have time to play games with everyone, but did my best to move around and say hello to everyone and make sure everyone seemed to be having fun. 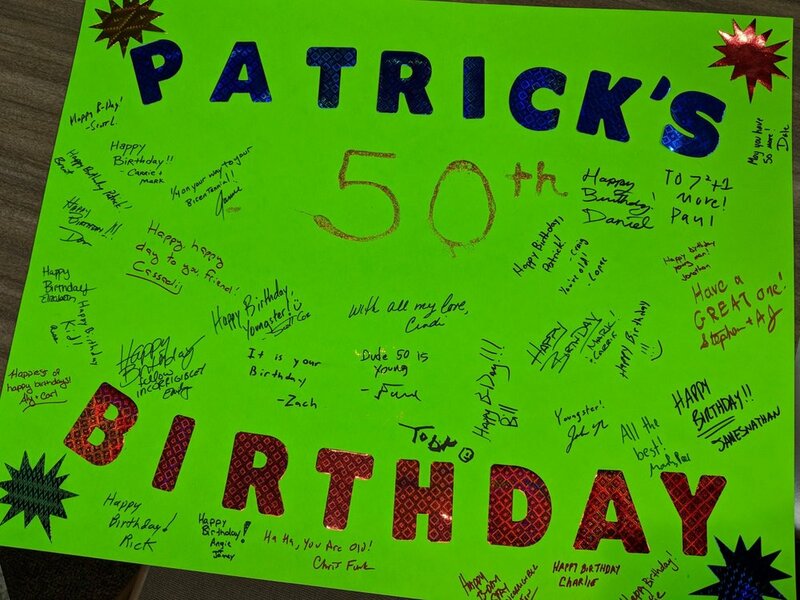 Thanks to everyone who came to celebrate, and to those who were there at the end and helped clean up.